Teacher Recruitment Test. Total available vacancies in Telangana TSPSC School Assistant Recruitment are 1941 posts. Interested/ Qualified/ Eligible applicants may go through the Telangana State PSC official web link @ www.tspsc.gov.in to apply for School Assistant Jobs. Online application forms for this TSPSC School Assistant Teacher Recruitment Test available from 30-10-2017. Closing date for submission of TSPSC online applications is 30-November-2017. TSPSC School Assistant Recruitment selection will be based on Written Test (Teacher Recruitment Test). Final merit list will be prepared based on combined marks obtained in TRT Written Test (80%) and TET (20%). After the recruitment process of School Assistant, selected candidates will be offered monthly pay scale of Rs. 28,940/- to Rs. 78,910/-. 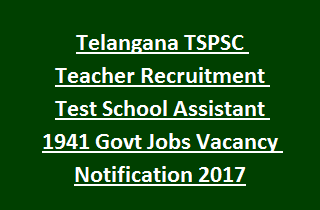 Check the notification for Examination Fee, Application procedure, Age limits, Selection process, Educational Qualifications of Telangana TSPSC School Assistant Teacher Recruitment Test Notification 2017. Total SA Vacancies available in TSPSC School Education Department TRT Recruitment are 1941 posts. 2. School Assistant (Urdu Medium): 196 posts. Candidate must have passed Graduate/ Post Graduate degree in concerned subject with B.Ed/D.Ed from recognized university. And must have qualified APTET/TSTET/CTET. Pay scale for TSPSC SA Vacancies is Rs. 28,940/- to Rs. 78,910/ plus allowances. Applicant must have the age limit between 18 years to 44 years as on 01-07-2017. Relaxations in age admissible as per Telangana Govt rules. TSPSC Authority will recruit candidates for School Assistant Jobs is based on written test (Objective type). And also TET Exam (APTET/ TSTET/ CTET) marks are also consider for selection. Written Exam consists of 160 objective type questions. Total marks are 80. The Duration is 2 hrs 30 minutes. Examination fee for general candidates is Rs. 80/-. Online processing fee is Rs. 200/-. No Examination fee for other candidates. Applicants who are interested to apply for these TSPSC SA Vacancies using the official website www.tspsc.gov.in. Application forms available from 30-10-2017 to 30-11-2017. Fill the application and submit before 30-November-2017.